After reading a few really bad reviews elsewhere, I will, once again, walk alone against the wind and play in true honesty the devil’s advocate role. I’m a maverick and I will always be a free mind, but most of all I will always be an admirator of real creators. The Swedish TWILIGHT FORCE armada is everything I love! I remember hearing the name of this band for the first time because of their amazing singer, the talented Mr Christian Eriksson who performs some fantastic vocals in the SUNSTRIKE’s (an ASTRAL DOORS side-project) debut album and early 2014’s highlight titled “Rock Your World”. He was also a determining key factor in the success of last year’s “Strange Nostalgia” by THE THEANDER EXPRESSION a pure jewel of Scandinavian AOR in the most authentic way! His work for “Tales Of The Ancient Prophecies” is once again truly impressive maybe it’s his best performance ever. Christian Eriksson is indeed a very talented frontman with an incredible vocal range and an amazing control. This time he shows another side of his capacities stretching himself to reach the stratospheric heights of the Asgard’s Ivory Gate (“Twilight Horizon”). Bombastic and epic are the most common denominator of the TWILIGHT FORCE’s sound identity. The symphonic elements are also quite prominent, so i believe you’ll get easily my view by now. It’s an album about dark magic, glorious battles, enchanted swords, evil wizards and mighty dragons . The mood is really set in the majestic Heroic Fantasy spirit in the vein of VIRGIN STEELE / BLIND GUARDIAN / ROYAL HUNT / RHAPSODY OF FIRE / FREEDOM CALL / DRANGONLAND / PATHFINDER / LOTHLÖRYEN etc. They like to call it Adventure Metal! While the thematics seem a little corny, the musical style is full of mastery, virtuosity, and creativity. Beside the magnificent vocal performance of Christian Hedgren Eriksson, the playing level is sky high! Obviously the best asset of TWILIGHT FORCE, the keyboards/axe interactions are mindblowing, and generally the lead guitars parts are quite spectacular in the superb Malmsteenian shredding tradition. Giving once again the strong proof that something strange had infected the drinking water in the mighty Swedish lands! 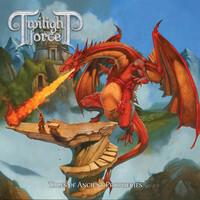 The TWILIGHT FORCE’s creation occured in the year of grace 2011, when two gifted young Metal knights Felipe and Daniele tried their best to honor the Northern Gods of Steel and the golden era of Epic & Symphonic Power Metal. Their artistic quest is directed by a divine goal: finding the perfect alchemy. They wanted to recreate a new musical alloy, in combining strong melodies with intense orchestral arrangements enhanced by hyper fast tempos with an ultra density in their Metal Edge (“The Power Of The Ancient Force”)! The Fellowship of the noble TWILIGHT FORCE was completed by a very solid & efficient rythm brigade, but the incredible talent of Christian was the missing jewel. It was the fundamental element in order to keep this magical phenomenon growing and finally reaching its monumental peak! The only low point is the relative shortness of the album and the chessy cover art. I’m already in waiting for the next opus and if you are attracted by high profile, adventurous, ambitious and exalted music, this silver platter will quickly become your new sacred Talisman. The supreme Crusade has begun!